This Boys 3 - 8 year old zipper necktie has a pre-made knot.A high grade zipper is sewn into the small end of the necktie as seen in the image above.The image also shows the loop that opens to go over the neck.The loop is made larger simply by holding the knot and pulling on the loop.To tighten the loop hold the small end a lift the knot. SIZE - The length of the tie is 11 inches from the top of the knot to the tie of the tie. It is 2.50 inches at the widest point. FABRIC - Made using woven 100% Microfiber making this boys zipper tie very durable. STRUCTURE - A thick interlining allows for a nice knot to be tied and the tie to hold its shape. Quality Zipper Makes this tie easy to put on and remove. The pre made knot slides up and down on a zipper sewn into the small end of the tie. Perfect for boys 3 - 8 years old. OCCASION - Perfect accessory for Weddings, Parties, Church and School. 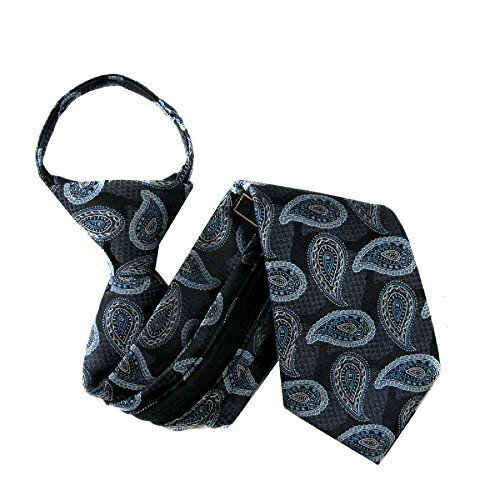 If you have any questions about this product by Buy Your Ties, contact us by completing and submitting the form below. If you are looking for a specif part number, please include it with your message.